← Could There Be An Olympic Snowboarding Boycott? Serious skateboarders know the importance of selecting a quality skateboard that can handle the everyday “grind” that they place on it. Durability, craftsmanship and price are important not just to professionals but also for beginners. Nobody appreciates paying the big bucks for a board only to find out that it isn’t worth its weight in salt. If you are new to skateboarding or are looking for a quality skateboard for a friend or child, know that there is a middle ground between the expensive premium boards and the cheap, low-quality versions that are sold at big-box retailers. The Powell Golden Dragon Flying Dragon Complete Skateboard is perfect for those who desire a quality board at a reasonable price. Several professional skateboarders, such as Steve Caballero, have touted these Golden Dragon skateboards as perfect, high-quality skateboards for beginners and frugal experienced skateboarders. Each and every piece of this complete deck has been forged for durability and factory-tested to ensure an overall superb product. With a quality skateboard in hand, you now only have to worry about learning how to use it! Virtually no product is completely one-sided; there are always advantages and disadvantages no matter what item. 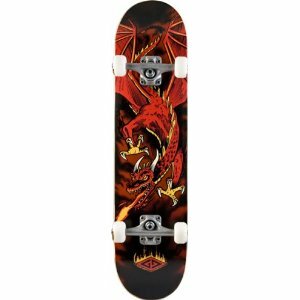 With the Powell Golden Dragon Flying Dragon Complete Skateboard, however, the pros definitely outweigh the cons. First of all, the board is fast, even with riders who are in the vicinity of 200 pounds. The treaded wheels are remarkably smooth and glide along, seemingly ignoring the concepts of friction. The deck is completely covered with grip tape and the trucks are firm. The overall durability of the board is amazing considering the light weight, a signature for golden dragon skateboards. The complete board set also comes with an instructional DVD to help beginners learn the basics of skateboarding. The list of cons with this skateboard are few and far between, but may matter to you depending on your circumstance. Initially mentioned as a pro, the overall speed of this board may be a liability when considering it for young children. If the child is being properly supervised and is not allowed to skate on extreme grades or slopes, this should not be an issue. There is also some disagreement among owners of the board as to the overall quality of the bearings and some owners have reported a quicker-than-usual slowing of wheel movement over time. Nevertheless, these issues are miniscule when considering that these parts are usually replaced in time anyways and that the complete system costs less than a tank of gasoline. Whether you are an amateur looking to buy a better skateboard than the ones available at Wal-Mart or a seasoned skater who does not want to forgo quality for price, this model in the golden dragon skateboards line has much to offer. At approximately $50, it is easy to see why Powell’s Golden Dragon line is so popular these days among all experience levels of skaters. If you’ve been on the fence about making a commitment to a skateboard, stop grinding and alley oop onto the right side with the Powell Golden Dragon Flying Dragon Complete Skateboard! This entry was posted in Powell, Reviews, Skateboarding, Skateboards and tagged Golden Dragon, Powell, Skateboard. Bookmark the permalink.